Rabbi Zelig Sharfstein talks to Chabad-Lubavitch emissaries about contemporary questions in Jewish law. Associates of Rabbi Zelig Sharfstein, the chief rabbi of Cincinnati, Ohio's Vaad Hoir rabbinical authority who died on Monday, remembered him as a brilliant authority on Jewish law who spent hours each day responding to questions from around the globe. Sharfstein, a New Yorker by birth, was 79. Born Ezriel Zelig Sharfstein on Manhattan's Lower East Side in 1928, his father, Avraham Zev Sharfstein, was a Latvian immigrant who served as the unofficial rabbi in New York City's first Lubavitch synagogue. Trained as a ritual slaughterer, Sharfstein's father came to the United States in 1911 and lived a modest life. After his spouse suddenly passed away, he married Esther Rutman, a Polish immigrant, in the mid-1920s. It was his mother's family who introduced Sharfstein's father to Chasidism, which her brother-in-law, Isser Yaffe, would study with him every Shabbat morning before prayers. In one of his visits, Rabbi Ezriel Zelig Slonim, a traveling emissary of the Sixth Lubavitcher Rebbe, Rabbi Yosef Yitzchak Schneersohn, of righteous memory, saw the pair learning, a novelty in a country then considered by the Jewish world to be treif, or not kosher. Slonim wrote to the Rebbe about the "wondrous sight," and the Rebbe later began a correspondence with Sharfstein's father. When he visited the United States in 1929, the Rebbe ate the fowl slaughtered by the father. Years later, the Rebbe escaped from war-torn Poland and moved to the Crown Heights neighborhood of Brooklyn, N.Y. Sharfstein's father, despite his advanced age, frequently walked on holidays to the community from his Lower East Side home. He sent his two youngest children to learn in the Rebbe’s newly-opened Lubavitch yeshiva. Sharfstein's father once asked the Rebbe for a blessing that his children would be accomplished in their Torah studies, and the Rebbe responded, in Yiddish, that for that, he couldn't give a blessing: "They need to want [it], and place the effort on their own." According to accounts, Sharfstein lived the Rebbe's exhortation. When he was 11, his father sent him and his brother Mottel to spend the High Holidays at Lubavitch World Headquarters in Crown Heights. The brother related many years later in an interview with Jewish Educational Media that the experience left a great impression on them. "I was amazed when I saw Rabbi Avraham Ziskind praying," said the brother. "He stood for the [the silent standing prayer] for an hour and a half. I stood for the [prayer] for about five minutes and was very exhausted, [but] he stood there for a very long time. "I could not believe that there should be another Jew that could pray like [that]." During his time in the yeshiva, Sharfstein delved into his studies with other American students. Encouraged by the Rebbe, he took part in New York's Release Time program, which allowed yeshiva students to teach public school students about Judaism for an hour each week. In 1947, he traveled with two other rabbinical students to the Catskill Mountains resort area to spend a month teaching vacationers about Judaism. In the late 1940s, he and other rabbinical students assisted the Rebbe's son-in-law and the future Rebbe, Rabbi Menachem Mendel Schneerson, of righteous memory, in preparing several volumes of Chasidic thought for print. 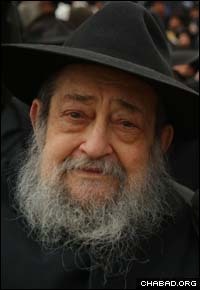 Sharfstein received his rabbinic ordination in 1952, and at the instruction of the Rebbe, he expanded his learning in Jewish law. He later taught in the Lubavitch schools in Bridgeport, Conn., and Pittsburgh, Pa., until the passing of his father in 1954, when he returned to Brooklyn. A few months later, Sharfstein married Reba Kazornovsky and was hand picked by Rabbi Eliezer Silver, chief rabbi of Cincinnati, to teach in the city's Jewish Day School. In 1964, Silver, then the president of the Agudath HaRabbonim and one of American Jewry's foremost leaders, promoted him to principal. Following Silver's death in 1968, Sharfstein took over as chief rabbi of Cincinnati's Vaad Hoir, a position he filled until his last day, with the encouragement of Rabbi Moshe Feinstein, one of modern Jewry's most influential halachic decisors. Feinstein held Sharfstein's command of Jewish law in high regard. "I do not remember having a subject matter for which he did not have an answer," said Rabbi Hanan Balk, chairman of the Rabbinical Council of Cincinnati and rabbi of the Golf Manor Synagogue. "[His answers] were always well researched and well sourced. He had an incredible knowledge in Jewish law." "He approached every issue with truth and seriousness," added Rabbi Nochum Kaplan, director of the Central Committee of Chabad-Lubavitch Rabbis in the United States and Canada, who would speak to Sharfstein several times a week. "He was somebody who was able to see past all the extraneous things that cloud an issue, to see the heart of it. "He took upon himself things that others were scared to take upon themselves," added Kaplan, who noted that he responded to thousands of requests, many from lay people all around the world. "He was always available," said Rabbi Zalman Wolowik, co-director of Chabad-Lubavitch of the Five Towns in New York. "He understood right to the core of every issue." "I never heard a word from him that was not true," said Kaplan. "If he wasn't sure about something, he didn't give an answer. "He was not afraid to engage people when someone questioned him on what he said," he added. "He was always willing to explain what his sources were." "He was a very humble person," said Balk. "He did not show off what he knew, he wouldn't flaunt his learning. But you asked him something, and suddenly his vast knowledge came out. "He was a rabbi to rabbis. [His passing] is a great loss to our community." Sharfstein is survived by his wife Rebbetzen Reba, his children Rabbis Zevi and Mendel of Brooklyn, NY, and his daughters Esther Gutnick of North Bondi, Australia and Shiffy Landa of St. Louis, MO.